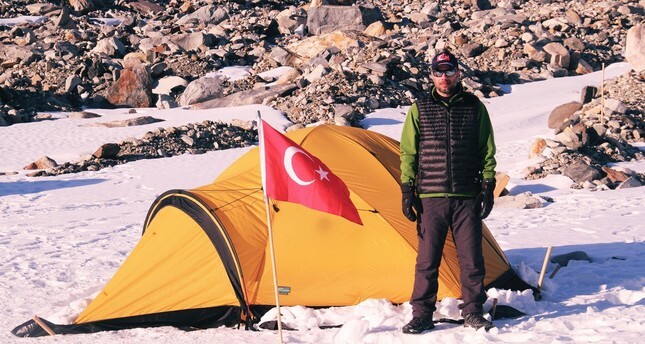 Turkish researcher Mehmet Yeşiltaş conducted his studies at Belgium’s base on Antarctica. Eight scientists from various universities in Turkey conducted scientific studies at research bases and ships of Chile, Belgium, Korea and Colombia as part of bilateral cooperation and the Third National Antarctic Science Expedition, which was made possible by the Turkish Presidency, the Ministry of Industry and Technology and the Istanbul Technical University Polar Research Center (PolReC). Dr. Mehmet Yeşiltaş, an academician in the Kırklareli University Faculty of Aeronautics and Astronautics, conducted studies at Belgium's base on Antarctica as part of bilateral cooperation and returned to Turkey with samples. Speaking to Anadolu Agency (AA), Yeşiltaş said, "During the expedition, I made observations in east Antarctica and got three meteorites during the plate search. I am happy and feel honored to take the three meteorites to my country. " Yeşiltaş said that meteorites are parts of large-scale asteroids and planets and that by studying these meteorites, humanity can get more detailed information on asteroids and planets in the solar system. Yeşiltaş noted that he studied many meteorites during his education and research, wrote many scientific articles on the samples and spoke at many conferences. "It is a great feeling to add the Antarctica samples to my portfolio. What's more, Turkey officially got in the running in the space sciences after its first meteorite research effort in Antarctica along with leading countries that conducted similar studies there," said Yeşiltaş. Dr. Mehmet Yeşiltaş's three meteorites will be studied in cooperation with researchers from the NASA and ESA. Work conditions are quite difficult in Antarctica. Yeşiltaş said, "Air temperature, minus 15 centigrade, feels like minus 35 centigrade due 40-kilometer-per-hour winds." Yeşiltaş said there are many crevasses in the region: "Departing from Princess Elisabeth Base in Belgium with a guide, we arrived at the Antarctic plate after a five-hour journey and conducted meteorite research there. All the work was done in less than an hour due to bad weather conditions and the time problem. Taking into consideration that the return trip would take five hours, we departed for the base with our guide. In the short time we spent on the Antarctic plate, we found three meteorites based on pre-arranged protocols. We hope to conduct longer meteorite research expeditions with a more crowded group in the future." Yeşiltaş explained that these samples are quite important pieces and said, "With the planned research, the information inside the meteorites will be added to academic literature for the first time by Turkish researchers." Pointing out that the samples will be studied in cooperation with researchers from NASA and the European Space Agency (ESA) and officially registered on the global meteorite database, Yeşiltaş said, "In these days, which have witnessed the foundation of the Turkish Space Agency, data from the meteorites from Antarctica will definitely contribute to space sciences and maybe shed light on the unknown. I feel great pleasure conducting such an important project."